Domino’s is an Australian public company with a presence across six markets (Australia, New Zealand, France, Belgium, the Netherlands and Japan). The company is a household name and has grown to become a leader in a number of these markets. With more than 1500 stores, it is now considered the leading international Domino’s franchisee. Create a pizza, promote it across social networks or by any other creative means, and earn a piece of the profit for every pizza sold. That’s the premise behind Domino’s groundbreaking Australian Pizza Mogul platform. In just 11 months, Pizza Mogul initiative has resulted in 63,000 users, 130,000 pizza creations and more than 10,000 pieces of user generated content. The idea behind Pizza Mogul goes back to 2012, when Domino’s launched an experiential iPad app called ‘Pizza Chef’, which allowed users to visually drag and drop toppings to create their ultimate pizza designs. Seeing a significant increase in basket size for orders made through Pizza Chef, Domino’s wanted to push the idea further. They partnered with ThoughtWorks to bring the world-first idea to life. Pizza Mogul was launched in July 2014, with less than five months of development. Pizza Mogul is an interactive platform designed to appeal to entrepreneurs and social media-savvy pizza lovers. Domino’s goal was to recruit new users to the brand and drive brand engagement by harnessing the power of social selling and viral advertising to unlock new revenue streams. Listening and responding to their customers, Domino’s designed Pizza Mogul in a way that reduces barriers to entry, allowing people to become Moguls within seconds. The app entices users to get involved with its ‘Play First, then Sign Up’ approach. Users can start creating pizzas in one click. The device-agnostic Pizza Mogul platform was created with social media at its core. Focused on creating a smooth and shareable customer experience, Pizza Mogul integrates with social media platforms as well as Domino’s existing online channels. This allows Moguls and customers to seamlessly design, promote, and complete a purchase, all the while giving them the security of any other Domino’s order. Leaderboards keep millennials engaged by gamifying Pizza Mogul. Each week top-selling Moguls are ranked publicly and a variety of bonuses are awarded. With digital being a key driver for Domino’s growth, the selected technology stack and microservices architecture provide Domino’s with flexibility to pivot and make changes. Each element of the application can be modified easily in isolation, so the product can be continually improved as customer preferences change, and new technologies emerge into the market. Pizza Mogul is a revolutionary new business model that has flipped the consumer model on its head. It gives consumers the chance to make their own profits through complete creative and marketing control. 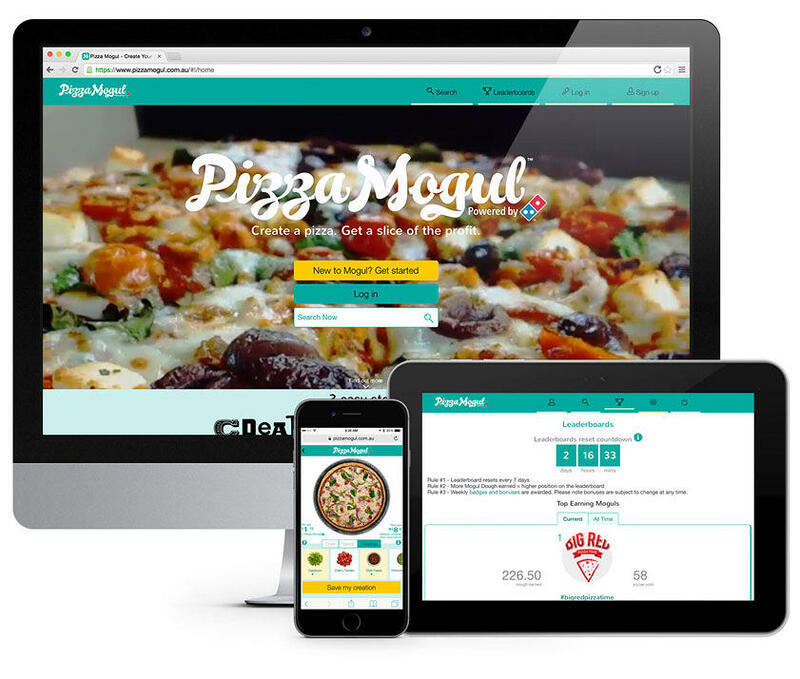 Pizza Mogul is recognised as a new way of marketing in which the user generated content belongs to Domino’s and thus can be shared freely to the wider market. Domino’s is riding the next wave of social retailing by embracing the global shift in power from corporations to the consumer. Domino's describes this trend as ‘me-tailing’, the fusion of social media and e-commerce. As Don Meij says, “This is, in my opinion, the future of retailing and I am so proud we have dreamt it and created it here at Domino’s”. In just 7 months, #FlavoursOfTheWorld, Toowoomba pair Emma Edwards and Cameron Blackburn, have earned over $52,000. Pizza Mogul, along with the $4.95 price promotion and a record number of newly opened stores, helped Domino’s post a $29.1 million net profit in the six months leading to December 31st 2014, up 44.2% from the first half of the year. Don Meij described Pizza Mogul as a strong sales driver for the company; the 22% growth in orders in the December half has been attributed to the social commerce innovation. Domino’s ability to enhance customer and franchisees experience through technology has been an exemplar to businesses in Australia and around the world. Want to hear more about their approach to innovation? Click here to view Domino's Group Chief Digital Officer, Michael Gillespie, talk about their digital journey and groundbreaking initiatives.